Implants? Crowns? Veneers? Invisible braces? As dental technology and services have expanded at Jim Erpenbach DDS in Knoxville, so has the vocabulary. Dentistry has advanced to provide many new solutions that address almost every possible dental issue. In the past, if a patient had a missing or severely damaged tooth, the options were limited to dental bridges or dentures. 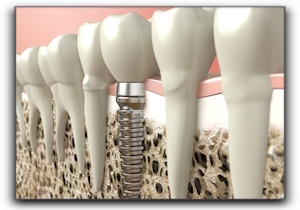 These days, dental implants have proven to be superior to dental bridges for most Knoxville patients. They can also be anchors for dentures for some patients. Longevity – Dental implants are heavy-duty and permanent, meaning with proper care they can last ten years or more. Seamless – Fabricated to have the same shape, size and color of the original tooth, the implant will blend seamlessly with all the other teeth. If the original tooth had aesthetic troubles, these can generally be corrected with the implant crown. If you want to know if a dental implant is right for you, call Jim Erpenbach DDS in Knoxville for more specifics. We also provide family dentistry. Make an appointment today.